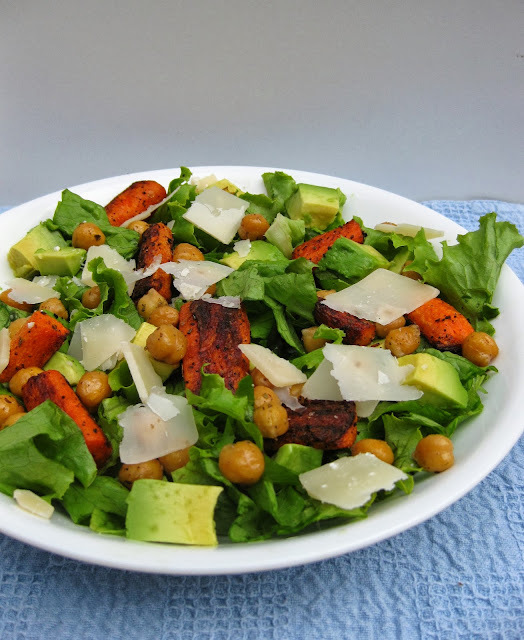 Remember this superfood salad I made last spring? I was obsessed with it and ate it every week for about a month. Then summer came and I got obsessed with fresh corn and this chopped salad. Now it's fall and, obviously, I need another salad to become obsessed with. I first got hooked on the whole roasted carrot/avocado combo at my sister's house. She served it to me in a salad and I was immediately smitten. Did I mention she's a genius in the kitchen? I tell you friends, there is something wonderful about the combination of avocado and roasted carrots. I think it's a texture thing. Also, the carrots undergo a sort of metamorphosis when roasted. They become sweet and softened and all kinds of crave-worthy. Combine those crazy carrots with creamy avocado? Uh-mazing. I think that's the connection between the three salads I'm obsessed with. They're salads that don't taste like salads. Weird, but true. Keeping with the busyness of fall schedules, I left this recipe relatively simple. I used italian seasoning on both the carrots and chickpeas, but you could easily substitute with whatever combination of spices you like. To keep the ingredient list short, I also nixed the quinoa and almonds, but you could add those in too. Just don't skip the carrots. Or the avocado. Or the cheese. Unless you're lactose intolerant, or a vegan, or doing paleo. Then you can skip the cheese. Just make it yours. And make it, like, tomorrow. Peel and clean carrots. Cut into 1-inch slices. Place on cookie sheet. Drizzle with 2 tablespoons olive oil. Sprinkle with salt and pepper and desired amount of Italian seasoning. Bake for 20-25 minutes, stirring at least once to prevent burning. After the carrots have baked for almost 10 minutes, place chickpeas on separate cookie sheet, repeating the with the 2 tablespoons olive oil, salt & pepper, and Italian seasoning. Cook for 8-10 minutes. Let carrots and chickpeas cool slightly before assembling the salad with remaining ingredients. *This will make a lot more chickpeas than you actually need. They are super addicting though, so it's nice to have some extra to snack on. Yum! Looks like a good one!